ACE is proud to offer Acupuncture CEU/PDA courses for Massachusetts Acupuncturists seeking to renew their license. Stay on top of your Acupuncture Continuing Education requirements and further your professional skills with ACE. Choose from a variety of different online courses pertaining to Acupuncture, TCM/Oriental Medicine, Herbs, Ethics, and Bio-Medicine subjects. We strive to make obtaining acupuncture CE online a seamless process, which is why you receive your certificate of completion immediately after passing the course. 30 Hours every 2 years, Massachusetts accepts NCCAOM approved PDAs/CEUs. The NCCAOM is a COA-approved organization. For NCCAOM Approved Courses, please visit the NCCAOM PDA or CEU Course page. As a condition of renewal, a full licensee is required to complete 30 hours of continuing acupuncture Education (CAE) in a Committee on Acupuncture (COA) approved acupuncture program or course or other COA-approved activity (this may include courses in western medicine or other healing arts). These hours must be completed during each 2-year renewal period that begins on the date that your license is issued or renewed by the COA and ends on the following renewal date. A minimum of 15 hours must be spent in COA-approved courses directly related to acupuncture. An excess of CAE credits earned during one license renewal period cannot be saved and used during a subsequent period; a total of 30 CAE credits must be earned during each 2-year renewal cycle. The State of Massachusetts requires potential licensees to obtain certain educational requirements to practice acupuncture within the state. Some of them include your standard undergraduate education, an undergraduate sciences and lab requirement, and completion of an acupuncture education. More specifically, the Massachusetts potential acupuncturists to meet a basic Herbology requirement, which is a minimum of 30 hours of herbal medicine training from a Committee on Acupuncture (COA) approved school or COA approved program in order to be re-licensed. After January 1st, 2009, applicants who perform herbal therapy (patent or raw) in their practice are required to submit evidence of completion of one of specific education (see below for more details). 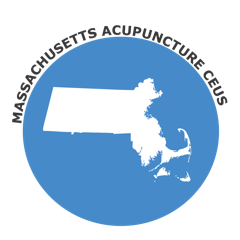 While this is a general overview, you can find additional details on the requirements to practice acupuncture in the state of Massachusetts on the Board of Registration in Medicine website. Can a physician practice acupuncture? Yes, in Massachusetts, a physician with an active status does not need an acupuncture license to practice acupuncture. Acupuncture is considered to be within the scope of the practice of medicine; however, many physicians who use acupuncture in their practice also have an acupuncture license. Does Massachusetts have a special license distinction for herbology? 2) Certification by NCCAOM in Chinese Herbology. To maintain the herbology distinction, a licensee must have a total of 30 hours of continuing acupuncture credits needed for biennial license renewal, of which at least 10 hours of training must be directly related to Herbology, of which 15 hours must be directly related to acupuncture and of which 5 hours may be indirectly related to acupuncture or herbology. What happens if I do not renew my license by my renewal date? If the COA has not received your completed renewal application by your renewal date, your license will lapse for non-renewal. Revocation for failure to renew prohibits you from practicing acupuncture in Massachusetts until you have completed the renewal requirements. You may reinstate your acupuncture license to either an active or inactive status by completing the lapsed license application and returning the application plus the fee of $300.00 immediately. If you are renewing on an active status you must enclose proof of completion of 30 hours of COA approved Continuing Acupuncture Education (CAE). Pursuant to 243 CMR 5.07(4)(c) a licensee who allows her license to lapse for more than two years shall be required to submit an original application for full licensure. The Committee may, at is discretion, require as a condition for re-licensure that the licensee complete all or part of the continuing acupuncture education that have accrued, or retake the licensure examination if the license has lapsed for more than 10 years. For more information and details, please visit the Massachusetts Acupuncture Board website.